Select the letters on the church plan to the left to find out what each part of the church is. (seen below) Click on each picture to see it better! When you have "looked around Trinity" here have a go at our interactive quiz here... and see how much you have remembered! Text taken from various guide books produced by Holy Trinity both old and new as well as other miscellaneous sources too. Originated before 1350. In fact it was originally a chapel in the medieval church. It was used a "Consistory Court" where archdeacon and his staff heard cases of indiscipline against the church's own legal system. The annual Archdeacon's visitation (when churchwardens are sworn in) also used to take place here. The roof dates back from the fifteenth century. Monuments formerly in other parts of the church were re-sited here during the restoration in 1854 - 1856. B Fragments of Medieval glass from "Godiva Window" originally on the south side. 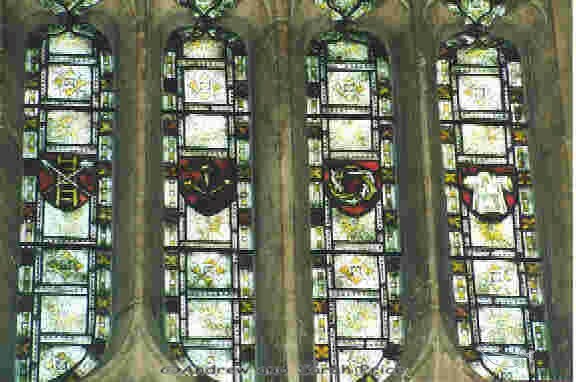 We know from church records that the church windows were rich in medieval glass. Sadly the reformers destroyed much of the glass in the sixteenth century. 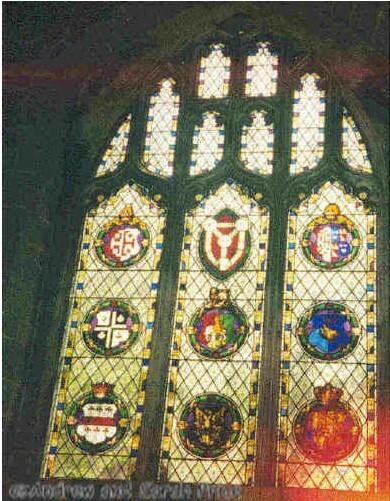 These fragments are all that remain and they form a part of one of the Archdeacon's Court windows. C North Porch c.1260 - The oldest part of the building. It was probably constructed in the early thirteenth century to be the Prior's entrance to the Norman church, since the south door of the Priory lay directly opposite. The first church built on the Holy Trinity site was the parish church for the lay tenants of the monastic lands, which stretched from Radford, Coundon and Keresley to Willenhall, Sowe, Harnall and Hawkesbury. This Norman church burned down in 1257 and only the North Porch remained. There is a room above which served as the thirteenth century vicarage; records show that the churchwardens leased it to the vicar of Holy Trinity in 1570, George Chestton, for 12d per year. Above can be seen the "Priest's room" which was used as a vicarage in the 16th century and is reached by an extremely steep spiral staircase. 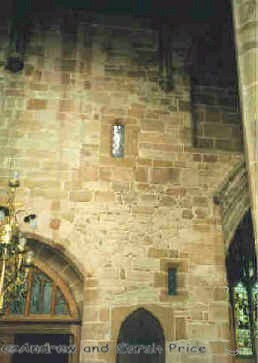 The north transept consists of a 13th century north wall. However, it is mainly 14th century. H. M .S. Coventry in the Falklands War and other memorials. F The Marler Chapel (or Mercers' Chapel) was founded in 1526-7 and was built by Richard Marler - a rich Coventry Merchant. (see also the reredos below) The ceiling which is finely carved (note that Richard Marler's merchant's mark is also carved here in the roof) at one end only, suggests the stop put to all such embellishments at the Dissolution of the Chantries (endowment for priest to celebrate masses for founder's soul) in about 1550. The chapel was refitted in 1917, but suffered some damage during the bomb raids in Holy Week 1941 when a single incendiary bomb broke through the ceiling. Burn marks are still visible on the floor. The gold carpet under the altar comes from Westminster Abbey where it formed part of teh carpet for the coronation of Elizabeth II. 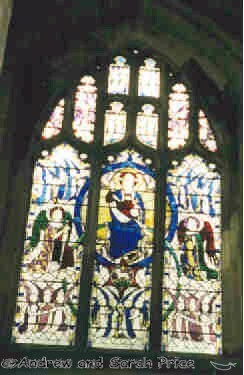 Holy Trinity is entitled to this piece because it is a Crown living i.e: the appointment of the vicar is made by the Queen. 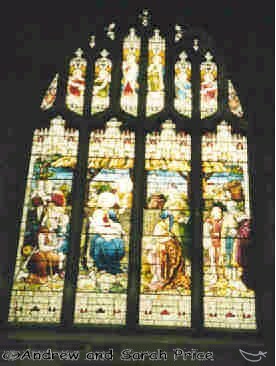 H The Nativity Window 1885 - in memory of William Lynes. J East Window depicting the Crucifixion - 1956 by Sir Ninian Comper (b.1864 d.1960 - a "flamboyant Anglo-Catholic architect and artist - follow for more on him and the Brides Window) - partly paid for by brides married in Holy Trinity. Previously blown out in 2nd World War. THE HIGH ALTAR: The chancel (choir and sanctuary) was rebuilt in 1391 and extended 7 metres to the east, making it 5 metres larger than teh nave. The altar has undergone considerable change: the original high altar was destroyed in the Reformation and the first Protestant Communion Table was set up in 1560. 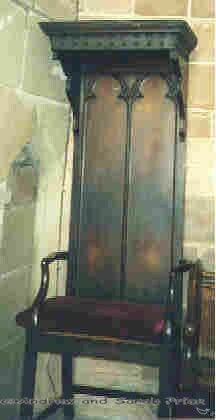 However, i the time of Archbishop Laud before the Civil War, a new high altar was installed in a raised position, which was not at all popular with the predominant Puritan feeling in Coventry, especially whden the Communion Table was removed. A contemporary annalist recorded "Also the Communion Tables were altered, which cost a great deal of money and that which is worst of all three steps made to go to the Communion Table, altar-fashion - God grant it continueth to not long". An Order of Parliament in 1641 led to a Vestry meeting where it was decided to restore the altar to its previous position, level the ground and take the rails away but communion "rayles" and steps are mentioned in the church accounts towards the end of that century. Then in 1854-56 restoration the area was greatly altered by Sir George Gilbert-Scott, who added the Minton tiles to the sancturary, and the brass communion rail. 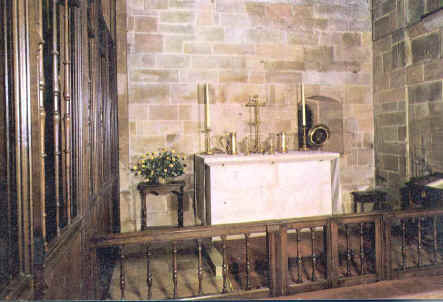 The reredos (altar screen) is also nineteenth century, carved from Caen stone, but the aumbry (wall recess), piscina (basin) and sedilia (seat) are all fourteenth century. The altar is dressed on special occasions in heavy brocade in the early seventeenth century Laudian style; the "Restoration" candlesticks were the gift of Vicar Hook, 1827-37. The Crossing and Tower. This dates from C.1380-1420. In 1854-56 during the restoration the lantern stage was opened up and the bells and ringing floor was removed. The tower was then refaced with Woolton Stone in 1915-19. L The Choir. This dates from the 1460's. At that time there was a finely carved and painted Rood Screen and loft with figures of Mary, Jesus and John, but this was removed in the Reformation. Churchwardens' accounts for August 1560 note "Payd for takyng down ye rode and marie and jhan, iijs.iijd payd to ye carpenter for pullying down ye rode lofft, iijs, viid" (4s 8d or 23pence) However the rood loft doors can still be seen up on the pillars one bay east of the crossing on teh north and south sides. 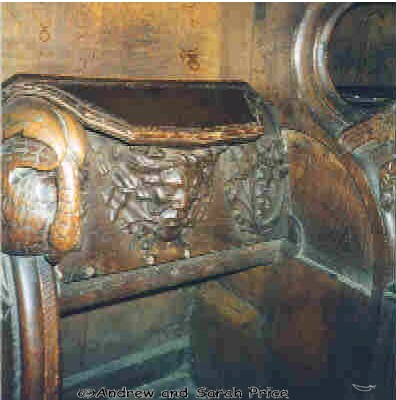 The Choir Stalls/Misericord seats on the south side several centuries old. These misericord seats started life at Whitefriars, went to the Old Grammar School at the Reformation, and to Holy Trinity when the present Henry V111 School was built in 1885. They are beautifully carved. 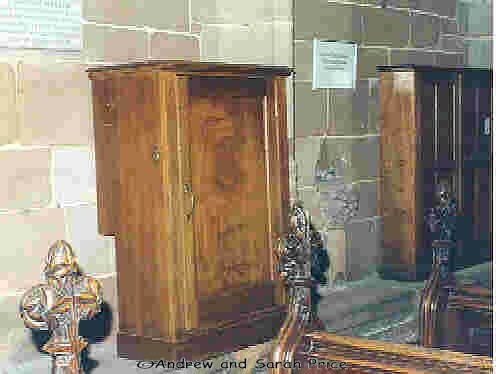 A misericord is a tip-up seat which one could lean on during a long service. M The Pulpit attached to the south east pier is traditionally considered to be circa 1470. However, more recent research indicates a date nearer 1400. The heads in the foilage may represent HenryVI and Margaret of Anjou: royalty often visited Coventry in its medieval heyday. 16th and 17th century records indicate that this too was painted and had the usual accompaniment of an hour glass. It was restored to its original state in the early 19th century. 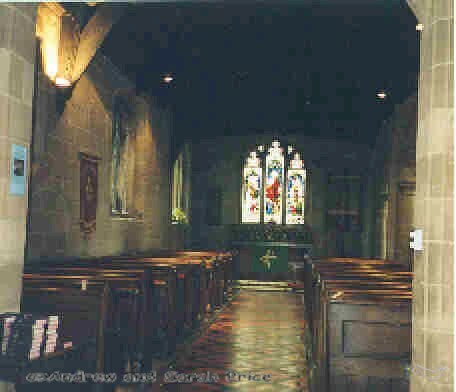 The stone reading desk faces north; prior to 1854 the preacher had to address the congregation sitting in the galleries all around the church interior as well as in the nave and chancel. N Eagle Lectern 15th century. It is one of only 33 known to have been cast in East Anglia in the early 15th century. Interestingly one of its contemporaries in in Urbino Cathedral, Italy. Made of brass and at one time used for collecting church funds, its beak being a mouth and the money being extracted via the tail feathers. The Lights - an example of which can be seen below. 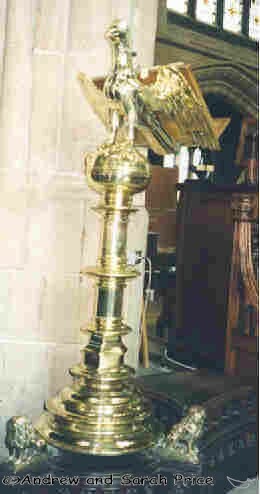 (select for enlargement) These brass lamp standards in the Nave and Choir and the communion rail are the work of Francis Skidmore and his company, "Coventry Art Works". He was a renowned Coventry metal worker in his time. He also created the choir screen in Hereford Cathedral which is now in Victoria and Albert Museum and the Albert Memorial. Apparently both Francis and his father were churchwardens at Holy Trinity. The lamps were installed before the 1854-56 restoration. O The South Transept also has a date of 14th century. The "Jesus Chapel" is cited in the south transept. This chapel originates from 1478 although the size was reduced in 1499 to the upper section. This was when a priests' house which was built next to the south wall and called "Jesus Hall" A "right of way" existed underneath for the local people as it had been cut through the transept from east to west. The original "Jesus Hall" was actually demolished in 1742 but the "right of way" or "Jesus Passage" was sealed off later in 1834. 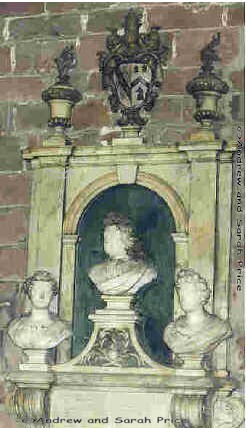 The Jesus altar was removed between 1558-60 in the first years of Elizabeth I's reign and the space used to store the organ. P Stone seats for the infirm before pews were added. Hence the expression " the weakest go to the wall"
Q 15th century font. This originally stood in the baptistry, although the exact location is not known. A Puritan order meant that the churchwardens had to remove it and they stored it in 1645 whilst replacing it with "a simple vessel to hold water". Following the Restoration of the monarchy, the font was brought to its present position. �3 16s 6d ( �3.83) was paid in 1662 for setting up the font. It is standing on a group of low well worn steps which are thought to have been the steps for a cross in a market square. It is so big because babies used to be (and can still be) totally immersed. It is filled by hand and drains away through a hole in the bottom. R The Doom Painting above archway (Last Judgment). Left side - Way to Heaven. Right side Way to Hell. For more photos and informaton on the Doom Painting visit our Doom painting index page To find out more about the iconography of the Doom painting click on the picture on the right. (seen here on the right is a 19th Century artist's impression of the Medieval painting). 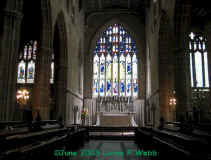 S The Great West Window (or "Te Deum" window) by Hugh Easton (1955). 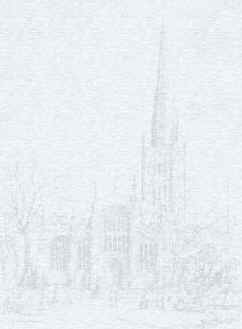 It represents the story of the Church of England. Find out more about this wonderful window by selecting this picture of the window. For those who enjoy a challenge........try our west window sliding puzzle applet! See if YOU are up to the challenge! However to find out more about this old organ please click the photo of the organ below and the page will open in a new window! Before leaving please sign our Guest Book and let us have your comments and ideas! Please email us on Sarah@take-a-pew.org.uk if you have any queries or spot any broken links or other problems with relation to this site as we want it to work for you! PLEASE NOTE: These are historic pages of Holy Trinity Church and the church interior may have changed since our photographs were taken as they do not post date 2005.
do NOT reflect the views of the official body of the church, Holy Trinity Church, Coventry. We run this site on a purely unofficial basis only. third party articles please consult the original owners. No responsibility can be held for any accidental inaccuracies or typographical errors. Although much of this material is copyright, we still welcome links to this site from other related topic sites. All that we ask is...........there is NO offensive material on the linking site. No official information is held on this site. Owned and run by Sarah and Andrew Price on their personal web space.